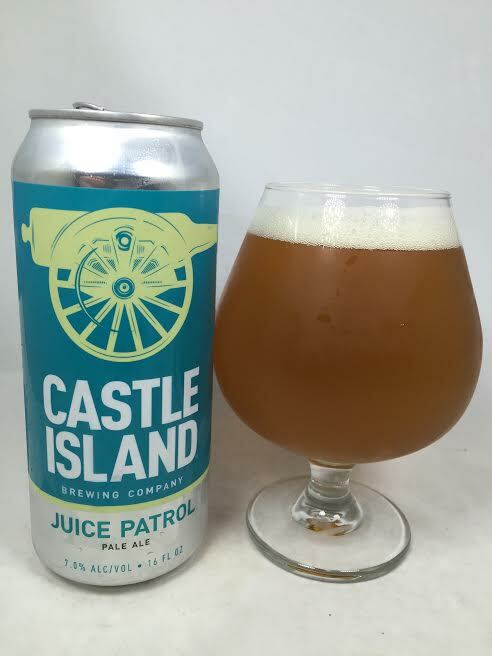 "Packing an all-star combo of hops, including Columbus, Cascade, and Centennial, Juice Patrol is a style-pushing pale ale with a gigantic citrus nose and a sumptuous texture. Ripe for the picking, enjoy this succulent hop bomb straight out of the can"
I didn't enjoy this out of the can. Sorry, I'm not sorry. Pours a hazy dark orange with a finger of white head. Lots of acidity and spice on the nose with pine and orange candy. I don't know about the name "Juice Patrol" because this is actually a spice bomb. The overall feeling is oily spices and black pepper. The bitterness can't be ignored as it has an amazing amount of bite for a 7% pale ale. It's actually impressive for the style and feels more like a standard IPA. The pine is back from the aroma, but with more of a tree bark and sap character, which, while complex, isn't the smoothest ride on the planet. I think they were going for more citrus juice in the name "Juice Patrol", but it's hidden so far in back, that it's barely worth mentioning. As this warms though, I do detect some grapefruit, but I think that accounts for some of the acidity as well. Mouthfeel is more like a standard IPA, but that's no surprise since this a 7% pale ale, so the body is right given the circumstances. A lot of the flavors wouldn't go well for a hot day, but they are still good in their own right, and if you dig the hop varieties used, then this will be easy to go through. I expected something different with a name like "Juice Patrol", but the end result was still satisfying. While not the citrus nuke I was hoping for, the Cascade and Centennial still provided a good variety of flavors that made for an incredibly bitter and spicy pale ale.